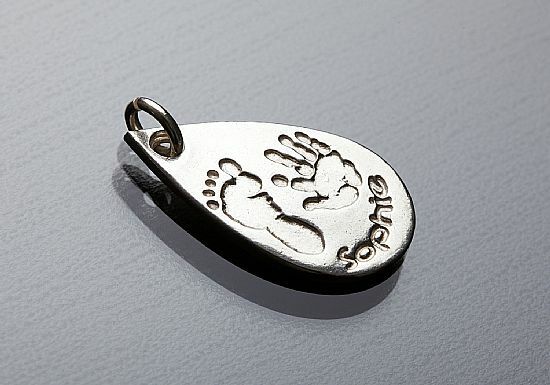 We offer pendants and other jewellery items in 99.9% solid silver, from babies', children's, and adults' hand & foot prints; from kisses; and even from pets' paw prints! Prints are taken here in our studio, using clean and mess-free materials. We then transform the print into a moulded solid silver piece of jewellery, with the name or your personal message imprinted. 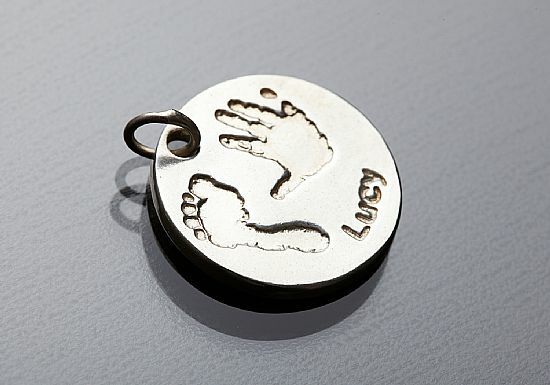 Pendants or charms are available in a variety of shapes, and we also produce cufflinks, key-rings, bookmarks & other solid silver items from foot, hand, or paw prints. See the gallery further down this page for a selection of the designs on offer. All items are supplied gift-boxed. Oval pendant, 18 x 26mm, 1.5mm thick, solid silver. 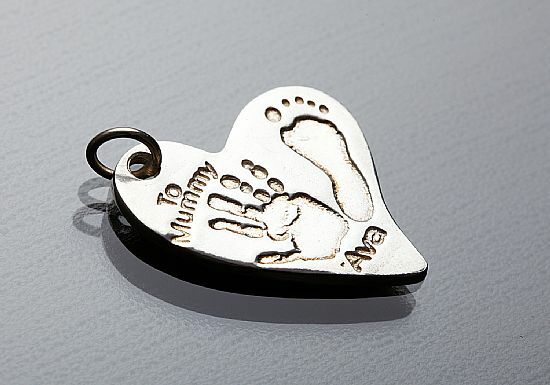 As a necklace: £80.00 including 20" sterling silver chain. 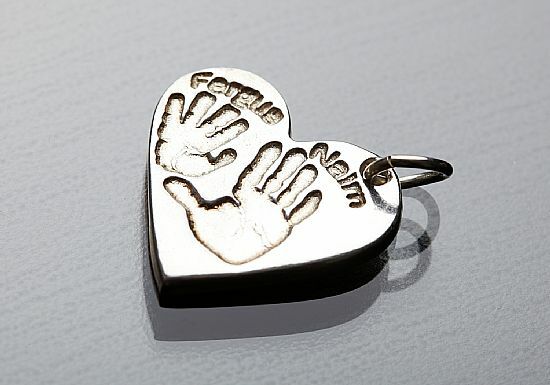 Heart pendant, 17mm x 21mm, 1.5mm thick, solid silver. As a necklace : £80.00 including 20" sterling silver chain. 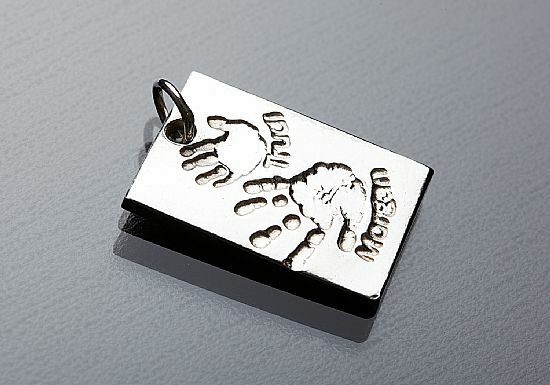 Diamond pendant, 20mm x 25mm, 1.5mm thick, solid silver. Round pendant, 24mm diameter, 1.5mm thick, solid silver. 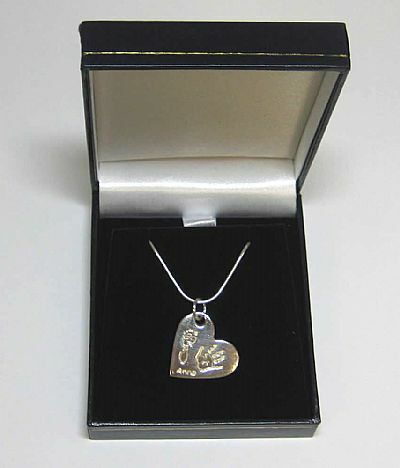 Offset heart pendant, 25mm x 31mm, 1.5mm thick, solid silver. Rectangle pendant, 17mm x 26mm, 1.5mm thick, solid silver. Teardrop pendant, 15mm x 27mm, 1.5mm thick, solid silver. 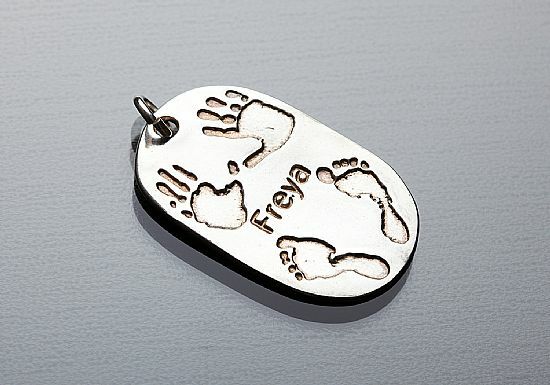 Dog tag pendant, 22mm x 37mm, 1mm thick, solid silver. 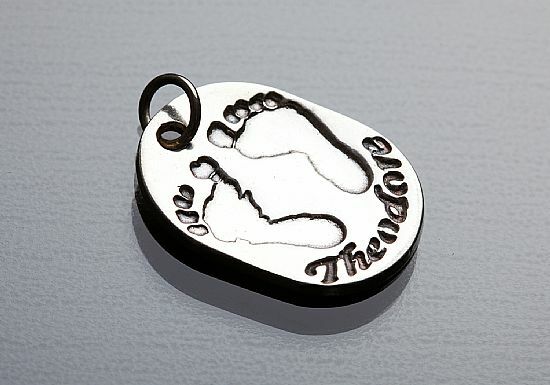 As a necklace : £86.00 including 24" sterling silver chain. 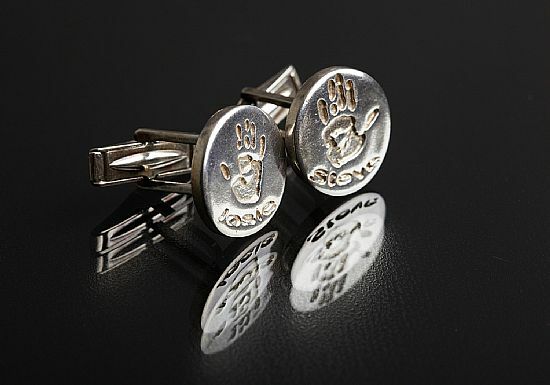 Round cufflinks, 17mm diameter, 2mm thick, solid silver. 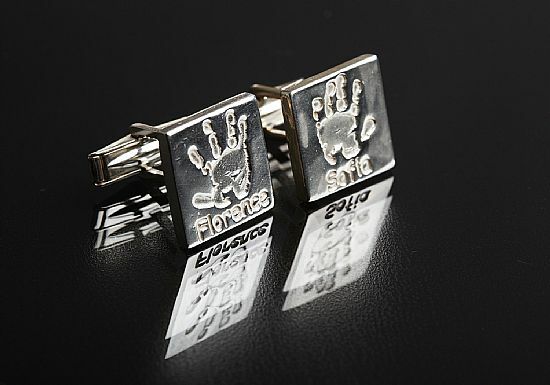 Square cufflinks, 16mm x 16mm, 2mm thick, solid silver.